After he was shot in broad daylight, President Kennedy was rushed to Parkland Hospital, where he was pronounced dead at 1:00 pm in Trauma Room 1. 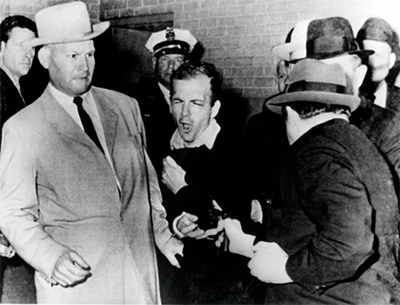 Two days after the assassination, suspected assassin Lee Harvey Oswald was rushed to Parkland after being shot in the abdomen by Dallas nightclub owner and mobster Jack Ruby. In a remarkable irony of history, Ruby died of cancer on January 3, 1967 in the same emergency room. Parkland. The very name conjures up the specter of gun violence on a historical scale. Most recently, in another Parkland, a section of the Miami metropolitan area with a median household income of $277,072, Majory Stoneman Douglas High School suffered a massacre at the hands of a profoundly disturbed 19 year old gunman named Nikolas Cruz. In the killing of Kennedy on the streets of Dallas in 1963, the gunmen used rifles. It appears that at least one of them fired a 6.5 X 52 mm Carcano model 91/38 infantry rifle. In the killing of Oswald, Ruby used a 38-caliber Colt Cobra. And in the Parkland, Florida shooting, Cruz fired an AR-15 style rifle. The guns may have consisted of different parts and were assembled in different ways, but the commonality that exists between them is the evil belief- one built into their construction- that killing people quickly and brutally is the answer to life's most difficult problems. In the case of Kennedy's killers, it is clear that they did not want him to be reelected for reasons that extended well beyond prosecuting the Vietnam War. Kennedy's murderers knew that the future he stood for would make their power obsolete. The dream and hope for peace, equality and prosperity for all is what the gunmen tried to kill that day. They failed miserably. With Oswald, his killer wanted to silence the truth. Ruby was paid to eliminate the patsy. In one shot, the conspirators hoped to make the only person who could expose the conspiracy go away for ever. The method was gunfire. But again, the result was not what they wanted. The result of Ruby's assassination of Oswald has been 50 years of radical truth telling, institutional reform, artistic creativity, and spiritual insight into the heart of darkness. Now, the students of Majory Stoneman Douglas High School have experienced the barbaric hate of a lost soul. With each shot, Cruz intended to answer the question of his own meaninglessness and anger. But, as was the case with Kennedy's murderers and Ruby, the psychotic Cruz failed to find what he was seeking. As with the nation after both Kennedy's and Oswald's execution, the students of Parkland answered the question put forward by their assailant with unbending courage and unstoppable justice. For it was Kennedy himself who once said, "We are not here to curse the darkness, but to light the candle that can guide us through that darkness to a safe and sane future." George Cassidy Payne is a freelance writer, domestic violence counselor, and adjunct professor of philosophy. He has been published in a wide variety of domestic and foreign blogs, journals, magazine, newspapers, and websites. He lives and works in Rochester, NY.